The TU-141 VR-2, Strizh (SWIFT) is a tactical unmanned reconnaissance aircraft. Fully recovered subsonic unmanned reconnaissance a/c. First flight - December 1974. Serial production 1979 to 1989, total output was 152 reconnaissance a/c. Operated by Russian and Ukraine army. The Tu-141 was a relatively large, medium-range reconnaissance UAV. Work began in the late 1960s, with test flights beginning in late 1974 and introduction to service in 1979. About 152 were built, including prototypes. It was not exported, but examples did fall into the hands of Soviet successor states after the fall of the USSR. The Tu-141 was another dartlike machine, with a rear-mounted delta wing, forward-mounted canards, and a KR-17A turbojet engine, providing 19.6 kN (2,000 kgp / 4,400 lbf) thrust, mounted above the tail. The wingtips folded for handling. The Tu-141 could carry a range of payloads, including film cameras, infrared cameras, and imaging radar. A target drone variant was considered but not built. The experience of development, testing, debugging, serial production and operation of the unmanned reconnaissance complex DBR-1 (Tu-123), as well as work on its further development of DBR-2 (Tu-139) with fully rescued unmanned aircraft allowed the OKB to proceed to work on the full rescued unmanned reconnaissance complexes of tactical and operational-tactical designation of the next generation. The result of these works was the creation, assimilation in the series and the deployment of the operational-tactical complex Tu-141 ( BP-2 Strizh ), tactical complexes Tu-143 (BP-3, "Flight") and its development Tu-243 (BP- ZD, "Flight-D"). Work on the complexes "Flight" and "Strizh" in the OKB began almost simultaneously. Many technical solutions for both complexes and the layout solutions of the unmanned reconnaissance aircraft themselves were close in their practical implementation, the differences mainly concerned the range of the systems. The unmanned complex of operational-tactical reconnaissance VR-2 "Strizh" was intended for conducting reconnaissance operations to a depth of several hundred kilometers from the front line, the tactical complex VR-3 "Reis" - several dozen. In the case of the Strizh complex, when designing an unmanned reconnaissance aircraft, initially it was a question of creating a dual-mode aircraft. It was assumed that an unmanned aircraft "141" at a transonic or at a small supersonic speed (1200-1300 km / h) would break through the enemy's air defenses twice (upon passage to the reconnaissance route and upon return to the landing site. pass on a cruising subsonic regime.The landing plane was to be reconnaissance aircraft in order to produce a ski before the landing.For such an algorithm of the use of the aircraft "141" insisted military. Preliminary estimates and calculations carried out in the OKB, that such an approach to the creation of a new unmanned complex will lead to an avalanche-like increase in the mass of the aircraft while trying to maintain the required basic flight and tactical data. Exit even for a short time to one of the most unprofitable transonic modes from the aerodynamic point of view would require taking measures to search for optimization of the aerodynamics of the aircraft, its power plant taking into account the peculiarities of this regime. It would be necessary to abandon a relatively simple single-mode air intake, use a motor of much greater traction, possibly with a forburner, which in turn would require an increase in the fuel reserve and, as a consequence, the starting mass, etc. Thus, some expected increase in the stability of the complex to the means of front-line air defense. Therefore, on the basis of long enough discussions of the problem, it was decided and agreed with the customer to abandon the supersonic regime and to limit the speed of 1000 km / h on the entire route of the reconnaissance flight. At the same time they refused to board the aerodrome on the skis, moving to the variant of vertical parachute landing with the inclusion of brake devices at the last stage. Gradually the proposed project of the "141" aircraft approached an enlarged large-scale copy of the tactical unmanned reconnaissance aircraft "143". In the final version of the ideological construction, the Strizh complex and its elements basically repeated their smaller counterpart, the "Flight" complex, and differed from it with the expanded composition of the airborne and reconnaissance equipment in a single variant of the configuration, the size of the reconnaissance aircraft and the new ground-based complex of facilities and services combat work. According to the layout scheme and technical solutions, the "141" aircraft became an enlarged copy of the "143" aircraft. The reconnaissance aircraft for the composition of reconnaissance equipment (aerial cameras, infrared reconnaissance system) is capable of performing the appropriate reconnaissance at any time of the day. The composition of the navigation and flight complex provided normal operation of the scout and its equipment at large distances from the launch site. For the complex, options were considered for equipping the "141" aircraft with reconnaissance means, based on quantum-mechanical generators (lasers) and introducing into the complex of radiation reconnaissance systems. The aircraft "141" was an all-metal low-wing, executed according to the "tailless" scheme with PGO. The triangular wing with a sweep along the leading edge 58°, had small sagging in the root parts. PGO - permutated on the ground in the range from 0° to 8° depending on the plane alignment, trapezoid in plan, with sweep angle along the leading edge 41,3°. Vertical tail was performed with a sweep along the leading edge 52°. The aircraft was controlled using two-section elevons on the wing and rudder. The fuselage is round in shape with a diameter of 950 mm in the cylindrical part, passing in the region of the engine's installation into an oval one. The air intake is subsonic, installed above the fuselage. By plane "141" was installed TRD type P9A-300 or KR-17A on the machines of later releases, with a static thrust of 2000 kg. The engine was arranged at an angle of 4.5° to the axis of the aircraft. The launching of the reconnaissance aircraft was carried out with the help of a powerful starting solid-fuel accelerator, mounted under the tail section of the fuselage. Landing reconnaissance aircraft after the assignment was carried out using a parachute system (brake and landing parachute) located in the fairing in the tail of the fuselage above the nozzle of the turbojet, as on the airplane "143". The chassis was made of a three-axle, heel type, which was produced on landing. There was a system for shooting the landing parachute and a braking solid-propellant power plant, which was included in the final stage of landing. Ground-based maintenance and the launch of the reconnaissance aircraft were carried out with the help of mobile ground vehicles SPU-141, TZM141, MT-141, KPK-141 and POD-3, which ensured the effective use of an unmanned reconnaissance aircraft, the rapid transfer of the main elements of the complex, maintaining the necessary level of combat capability. During transportation, part of the wing consoles deviated into a vertical position, which reduced the dimensions of the aircraft "141". Work on the "Strizh" complex was directed by G.M. Gofbauer, who headed the OKB direction in unmanned equipment prior to the early 90s, until his death, and spent a lot of work to ensure the design, debugging, deployment of mass production and development of Tupolev unmanned systems of a new generation of "Flight" and "Strizh." Since the beginning of the 1990s unmanned subjects in the design bureau were headed by Chief Designer L.T. Kulikov. The first prototype of the aircraft "141" flew in December 1974. The first experimental aircraft "141" were equipped with experimental engines KR-17A. The serial construction of the 141 aircraft was launched in 1979 at the Kharkov Aviation Plant (formerly No. 135), just before the end of the series in 1989, the plant produced 152 pieces of the 141 aircraft. The first installation lot of unmanned aircraft in the amount of 10 copies. equipped with engines of the R9A-300 type (the variant of the airborne TRD RD-9B of the MiG-190 aircraft, and then, after mastering the KR-17A series, the KhAZ switched to serial production of the reconnaissance aircraft with it.After the factory and state tests the "Strizh" is adopted by the Soviet Army. Most of the complexes were delivered to units stationed on the western borders of the USSR, and after the collapse of the latter, most of them were owned by newly independent states, in particular the armed forces of Ukraine. 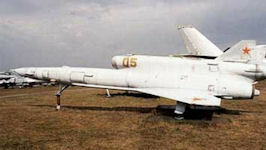 In addition to the main reconnaissance option, the Design Bureau was working on a target aircraft on the Tu-141 base.